Full Spectrum with High Red Ratio. Only useful wavelength selected, particular ratios made with red, blue and white leds, high-efficient for plants seed, veg, flower and fruit. Item Model: Mars 300 LED Grow Light. LED Diode Brand: Epistar (HI-LED) High Intensity. LED Diode Quantity: 60 Pieces. Coverage Area: 1.5' x 1.5' (45 x 45cm). Compare to HPS/MH/HID: 150 watt. View Angle of LEDs: 90/120 mixed. Dimension: 12" x 8" x 3(30 x 20 x 7cm). Par Value at 18: 445? Noise Level: 56 DB(decibel). Operating Temperature: 85°F -105°F (30°C - 40°C). Spectrum: 430440nm, 450475nm, 620630nm, 650670nm, white. Item Model: Mars 600 LED Grow Light. LED Diode Quantity: 120 Pieces. Coverage Area: 2' x 1.5' (60 x 45cm). Compare to HPS/MH/HID: 250 watt. Dimension: 17" x 11" x 3 (44 x 27 x 7cm). Par Value at 18: 980? 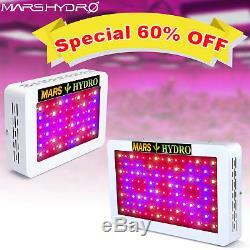 1 x Mars hydro LED Grow Light. 1 x Power Cord (Suitable for your country). Each box with 1pcs light; Plain package guaranteed. Only select spectrum useful to plants, make unique ratio after countless test, better photosynthesis than oridinary light. Our light with relative higher red ratio, especially good for flowering, high yields is possible only if you take good care of plants. Various factors will affect plants harvest, but light is a key factor. Possible to get better taste and richer nutrition under our light grow. All spectrum useful to plants, high-efficiency photosynthesis. Low par, limited effects on plant grow, low harvest. Spectrum cannot match what plants need, red light lacked, no good result. Limited spectrum; Mercury&rare halides contained, unhealthy. Recommended Hanging Distance: Seedling: 24"-30", Veg: 18"-24", Flower: 12"-18". Recommended Lighting Time: Veg: 18/6 or 20/4h (on/off), Flower: 12/12h(on/off). Keep the light away from water, sulfur, acid, which will destroy light easily. Light must be under stable voltage, instability affects working life. Don't look directly at light when it's turning on, wear led glasses to protect your eyes. Mars LED Grow Light & Grow Tent List. 1.5' x 1.5' (45 x 45cm). 3' x 2' (90 x 60cm). 4' x 4' (122 x 122cm). 2.5' x 2.5' (76 x 76cm). 3' x 3' (92 x 92cm). 3.5' x 3.5' (105 x 105cm). 4.2' x 4.2' (128 x 128cm). We strive to resolve all issues in a timely manner. Are you authentic Mars Hydro? When will my order be dispatched? What plants can we grow with your LED Grow Lights? Suitable for all growing stages? Our lights are suitable for all plants, like medical plants, tomotoes, lettuce, chills, eggplant, herbs and leafy vegetables, bok choy etc. Our lights can be used in all growing stages, from seedling, veg to flowering, fruit etc. The item "Mars Hydro 300W 600W LED Grow Light Panel Full Spectrum Indoor Plants Veg Flower" is in sale since Monday, December 11, 2017. This item is in the category "Home & Garden\Yard, Garden & Outdoor Living\Gardening Supplies\Hydroponics & Seed Starting\Grow Light Kits". The seller is "topledgrowlight-usa" and is located in Los Angeles, California. This item can be shipped to United States, all countries in Europe, all countries in continental Asia, Canada, Australia.